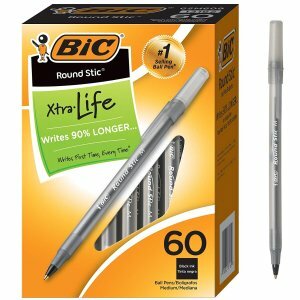 Amazon.com offers the BIC Round Stic Xtra Life Ballpoint Pen, Medium Point (1.0mm), Black, 60-Count for $3.00. Features: #1 Selling Ball Pen* *Source: The NPD Group/ Retail Tracking Service/ U.S. Actual Unit Sales (Retail & Commercial Combined)/ Jul 2016-Jun 2017. Writes 90% longer on average than Papermate InkJoy 100 Ball Stick Pen (Paper Mate and InkJoy are trademarks of Newell or an affiliate.